To donate to the Jordan Grisham Scholarship Fund, please visit the donate page. Very rarely is there a person that lives each moment with an attitude that is truly grateful and with a purpose that is totally surrendered. Very rarely is this person, this curiosity, a young adult, fresh out of high school. It was the Fall of 2012 and our new GAP class had just arrived and gone straight to evening church. “There’s Jordan,” Andy, pointed him out to me. I had wondered which one he was; which one had the brain cancer. Healthy build, fresh look, blonde hair – side swept, big, beaming blue eyes. He was grinning and talking at the same time to another student named Chelsea, never breaking eye contact – fully engaged. His conversation was so animated! What was he telling her? I knew what guys generally liked to talk about, sports, cars, mischievous things they got away with; but his facial expressions and mannerisms seemed different. No tough guy flick of the head, no cocked shoulder or sly grin. He was clearly unaware of himself; he was radiant and he looked so… thrilled! Later I discovered what he was telling her. I am sure of it because I saw the same joyous look each time he shared it – it was his vision for his future, the call of God on his life. God had called him to the mission field. At GAP Jordan was among those assigned to the ESL (English as a Second Language) ministry group. One of the first things the ESL team did was walk around town handing out invitations for free English classes. Jordan walked into a bakery and started talking to the teen behind the counter. He found out the teen’s name was Alejandro and invited him to the ESL class that was soon to begin at a nearby church. Alejandro showed up, liked it and became a committed student who returned week after week. Jordan shared the Gospel with Alejandro and gave him his Bible, encouraging him to read Romans. Jordan often said that he believed God was going to heal him because of his undeniable call to the mission field. But during the next two years the brain cancer progressed until it took his life. He passed away on May 24, 2015 at the age of twenty-one. During those physically painful days recovering from surgery after surgery he never lost his joy or questioned his calling. He fully trusted Christ. He boldly shared his hope in his Savior with the medical staff that attended him. After his second to last brain surgery Jordan woke up and declared, “not my will but Yours be done”. Jordan began to realize that he was, and had been, living out God’s call to the mission field! He had been a missionary. He had run the race! Jordan’s mother shared that never once did Jordan ask for pray to be healed, instead he asked for prayer that others would see Jesus in him. Oh Jordan, we did. We did! On May 1, 2017 Kathy and April, Jordan’s mom and sister attended our 2017 GAP graduation in Costa Rica. Jordan’s father, Daryl, who was unable to travel, joined us in spirit. We took a portion of our ceremony to remember Jordan and to present his family with a memorial, a framed photo and biography of him that now hangs at the SCORE Villa. Alejandro, Jordan’s bakery friend and ESL student, translated Kathy’s message and then shared his own testimony, adding a strong gospel invitation. 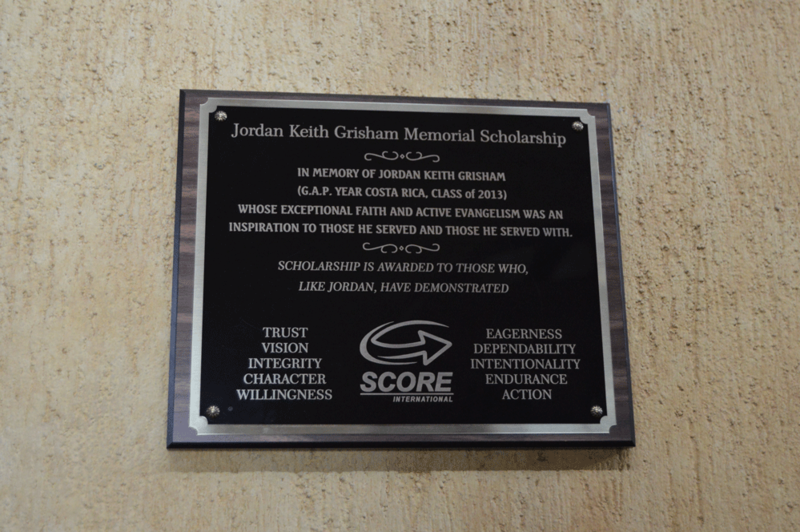 Beside the memorial hangs the Jordan Grisham Scholarship Fund plaque. It proudly boasts of who Jordan was and offers potential GAP students help with their tuition. Recipients of the scholarship must exhibit the same qualities that were seen in Jordan: Trust. Vision. Integrity. Character. Willingness. Eagerness. Dependability. Intentionality. Endurance. Action. Jordan was a curiosity – an individual full of gratitude, suffering yet joyful, wholly surrendered to Jesus Christ! Jordan’s mission is complete, but his mission field is still yielding a harvest. In memory of Jordan Keith Keith Grisham (G.A.P. Year Costa Rica, Class of 2013) whose exceptional faith and active evangelism was an inspiration to those he served and those he served with.